The mixing of digital and physical is growing stronger every day, in every aspect of life. Heck, when I tell people where I work, I say, "I work online." That blending goes to our gaming as well, as more games are adding in apps to not only help them run, but are an integral part of the process. A new game that brands itself as "phygital" is Blind Wazard Brawl. It's a deck-building game where players are wizards battling one-another in the Brawling Arena. The game is up on Kickstarter now. 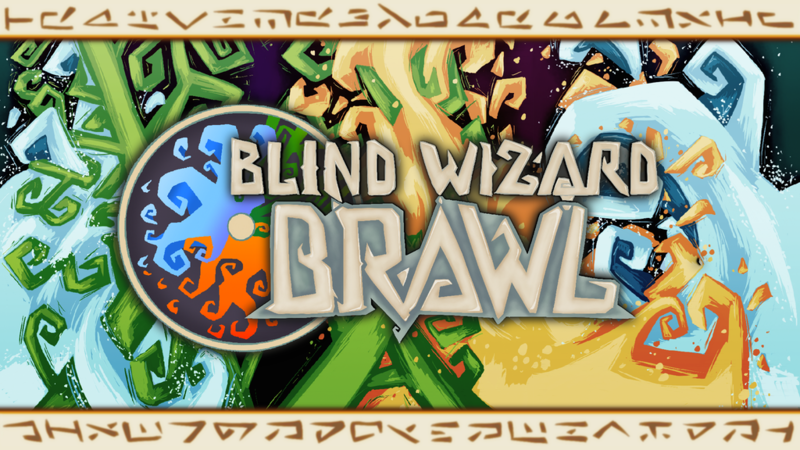 Blind Wizard Brawl is a "phygital" hybrid game, meaning it uses both physical and digital components for gameplay. It is primarily a tabletop game which has you and your competing wizard friends sit down and challenge each other for victory in the Brawling Arena! Each player will also be using a (free!) app which generates private characters, stats and abilities to be used during play. The game includes three decks, Wave Blaze and Growth. Each deck has four different art variations, and 3x copies of each of these. There are 12 cards in each deck. The game also includes three art transition cards and an instructions leaflet. There are only three primary card types in the game: Wave, Growth and Blaze. However, each type of card has a variety of artwork, all of which can be placed next to each other in any way you like to create endless dynamic panoramas out of your cards. The Kickstarter is about 2/3 of the way to its goal with still 27 days left on the clock.